Mexico. 1739-Mo MF Real. KM-75.1, Gil-M-1-11, Yonaka-M1-39, Cal-Type 262 #1601. MS-66 (PCGS). Mexico. 1761-Mo M 2 Reales. KM-87, Gil-M-2-36, Yonaka-M2-61, Cal-Type 139 #1325. MS-64 (PCGS). Guatemala. 1809-NG M 1/2 Real. KM-60, Cal-Type 362 #1280. MS-66 (PCGS). Bolivia. 1808 PJ Real. Potosi Mint. KM-70, Cal-Type 138 #1182. MS-65 (PCGS). Peru. 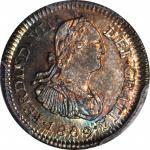 1796-L IJ 2 Reales. KM-95, Cal-Type 110 #943. MS-65 (PCGS). Spain. 1811-V SG 4 Reales. Valencia Mint. KM-453.2, Cal-Type 227 #830. MS-65 (PCGS). Peru. 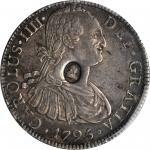 1794-L IJ 8 Reales. Lima Mint. KM-97, Cal-Type 76 #648. MS-63+ (PCGS). Spain. 1783/79-JD 1/2 Escudo. Madrid Mint. Fr-290, KM-415.1, Cal-Type 88 #775. MS-63 (PCGS). Spain. 1807-FA Escudo. Madrid Mint. Fr-298, KM-434, Cal-Type 59 #501. MS-63 (PCGS). Spain. 1807-CN 2 Escudos. Seville Mint. Fr-297, KM-435.2, Cal-Type 54 #459. MS-64 (PCGS). Spain. 1792-M MF 4 Escudos. Madrid Mint. Fr-294, KM-436.1, Cal-Type 23 #202. MS-62 (PCGS). Mexico. 1805-Mo Th 8 Escudos. Fr-43, KM-159, Cal-Type 8 #60. MS-62 (PCGS). Spain. 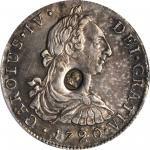 1721-SJ 2 Reales. Seville Mint. KM-307, Cal-Type 243 #1423. MS-66 (PCGS).